Spread apples evenly in bottom of pan. Top with dry cake mix; gently shake pan to distribute evenly. Pour melted butter over top, tilting pan to cover as much of the top with butter as possible. Bake 45 to 50 minutes or until light golden brown, mostly dry on top and bubbly around edges. Make sure to spread out the cake mix so there are not large mounds on top of the cake. Top with a scoop of ice cream or even caramel sauce for a delicious dessert! Nothing says fall like an apple cake! All you need to bake this cake are three simple ingredients: apples, a box of Betty Crocker™ Super Moist™ yellow cake mix and butter. You can even skip the bowl! Instead, you’ll spread your chopped apples in the bottom of a 13x9 pan, sprinkle with cake mix, and drizzle with butter before popping in the oven. It’s that easy! 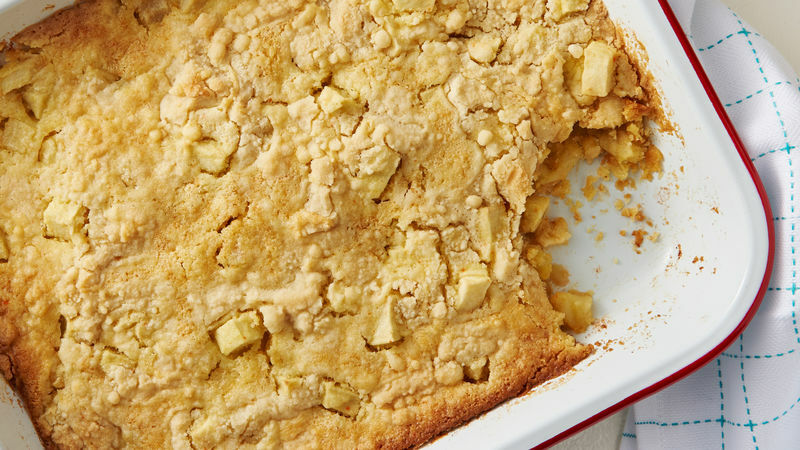 This apple dump cake might be the easiest way to enjoy the apple harvest, but if you’re hungry for more apple recipes, Betty’s got you covered with her array of apple cake recipes, plus all the instructions for making perfect cake.